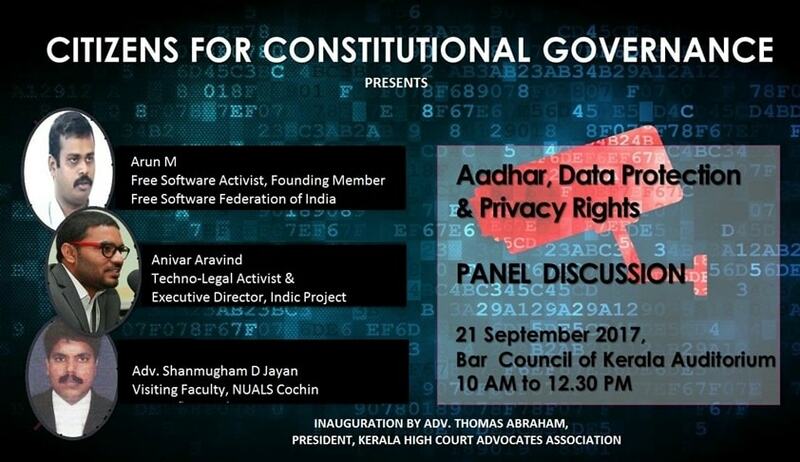 “Citizens for Constitutional Governance “ , a Kochi-based collective of person from the fields of law, technology, academics etc, will hold an interactive panel discussion on Aadhaar, Data Protection and Privacy Rights at 10 AM on 21.09.2017(Thursday) at Bar Council of Kerala Auditorium , Ernakulam. Panelists are Mr. Anivar Aravind, a techno-legal activist and Executive Director of Indic Project, Adv. Shanmugham D Jayan, author in IT Law and a visiting faculty at the National University of Advanced Legal Studies, Kochi, and Mr. Arun M, a free software activist and former board member of Software Freedom Law Centre in India. The technological aspects of biometric collection and storage, encryption of data in the central repository, data-mining, data sharing as well as data protection will be subject to analysis. Also, the jurisprudential and philosophical aspects of the right to privacy, and its width and amplitude in the virtual world will be discussed, particularly in the context of the recent privacy judgment of the Supreme Court. The panel discussion will be inaugurated by Adv. Thomas Abraham, President, Kerala High Court Advocates Association.